Our sitter had a Friday-Monday off in October, and with some slight miscommunication between Jeff and I, we BOTH booked days off from work to “watch” Vinny on those days. 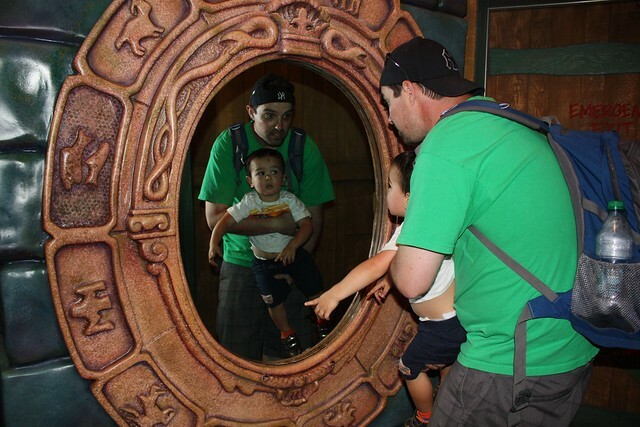 So we decided to take the opportunity to visit to Disneyland! 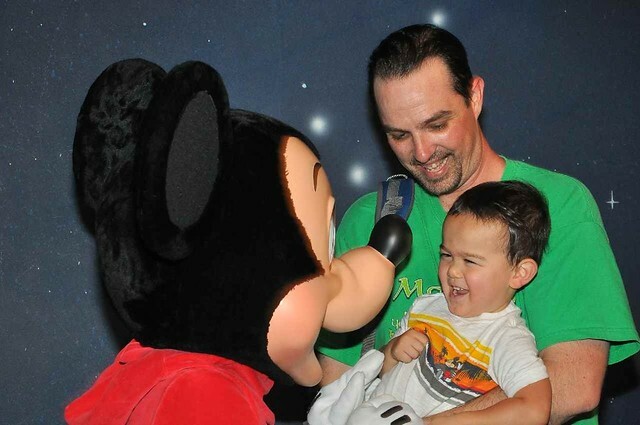 We originally planned to take him to Disney World in Floriday during our July vacation, but ultimately decided he was too young, and the Florida heat, summer, crowds, toddler — was not sounding like something we wanted to battle with. But off season, in the more moderate So-Cal weather, for an extended weekend, sounded like a lot of fun! We waited till the last minute to get our hotel room, so the Disneyland hotel was booked up. Which worked out better anyway, because it was going to be pricey $$$ to stay there, and i think we ended up liking Howard Johnson’s a lot better. Trip Advisor top pick – great kids pool area and still walking distance (8 min) from the park. We loved staying there and will probably go back the next time we visit. We left on Thursday night, drove from 101 to 46, to 5….. which was actually closed for construction so we got stuck in traffic at midnight! Vinny slept for a couple hours inbetween but was up when we arrived at the hotel. 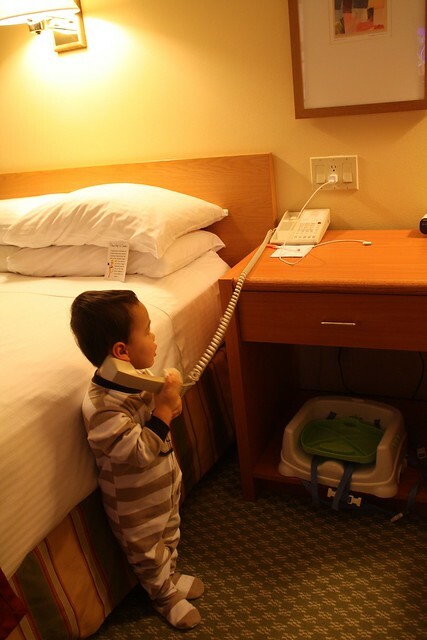 He was so excited to check out the room, and best of all a play telephone?! He took a while to fall asleep in his pack n’ play the first night — at one point i was hoping we didnt have neighbors who could hear from crying so late at night. But eventually he fell asleep. We brought his favorite bedtime blanket, stuffed glowing seahorse and his gray kitty. Since we got in late the night before, we got a late start to the park — was there by 10:15a, and it was busier than expected for being a Friday when everyone should be at work! 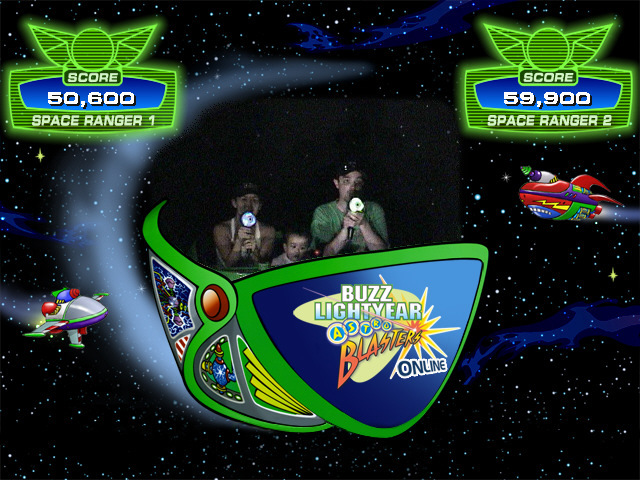 We went first to Tomorrowland and rode the Buzz Lightyear AstroBlasters ride. It’s a fun interactive ride you get to shoot with a laser gun at targets on the wall and you get a score at the end of the ride. 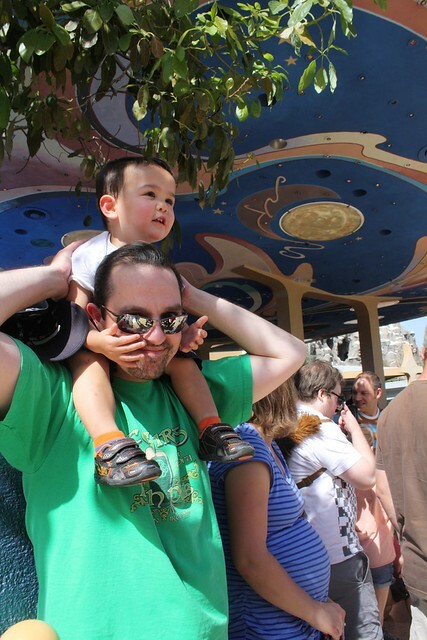 Jeff and i had been on a similar ride at California Adventure on our last visit. We walked up the big ramp to check out the Innoventions area — which is basically half museum half video arcade to promote Disney video games. 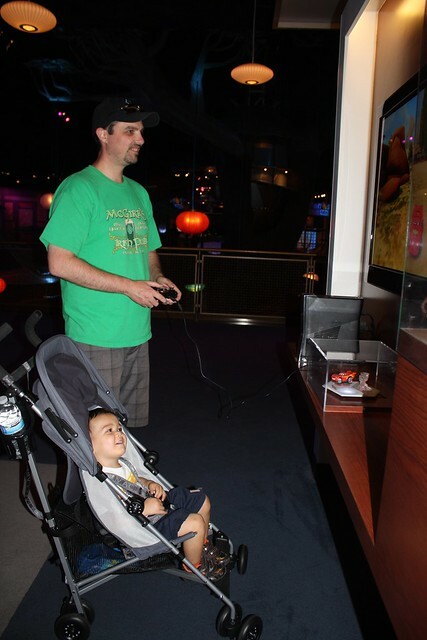 Jeff of course couldn’t resist picking up a free controller and playing a minute or two of a Cars game. They were both entertained as seen in photo. Next up, we ate an early lunch at the Tomorrowland eating area. I was impressed with their food choices. I had a salad, Jeff had a burger, and Vinny had a special Toddler sized meal of mac n cheese and apple sauce. Yum, he at it right up. 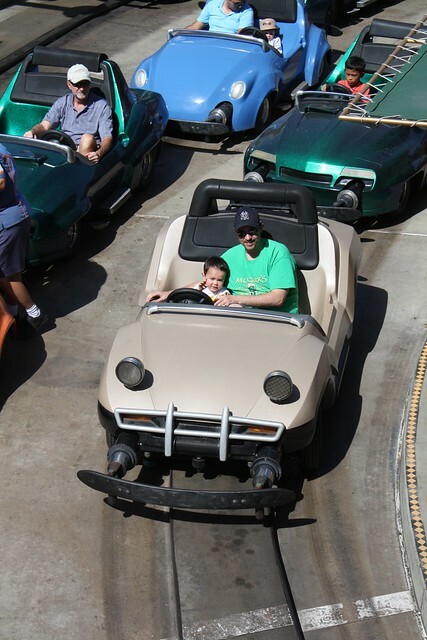 They were starting the Jedi training show as we were leaving, but Vinny was a bit young to participate, so we left to do our fast pass for Autopia ride. Since i’m pregnant, i decided to skip this ride and just take pictures. Vinny and Jeff had a good time driving the car on the track — Its one of Vincent’s favorite things to do back at home — sit in the front seat of my car and pretend to drive! They even got little driver license cards. Such a cute area of Disneyland – everything looks straight out of a cartoon! I remember this being my favorite part of the park when i visited at 10 years old. 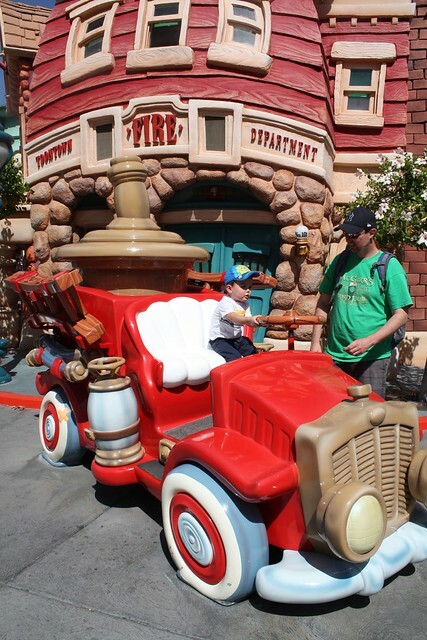 Vinny didn’t seem too impressed with the Firetruck here. But he did like running through the little jail/gym area (over and over again). 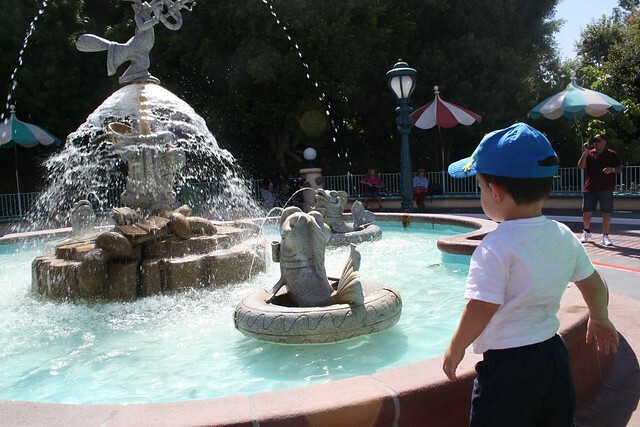 He also really loves the water fountains — i think he wants to dive in mostly. Weather was warm but not unbearable. Pretty comfortable actually. 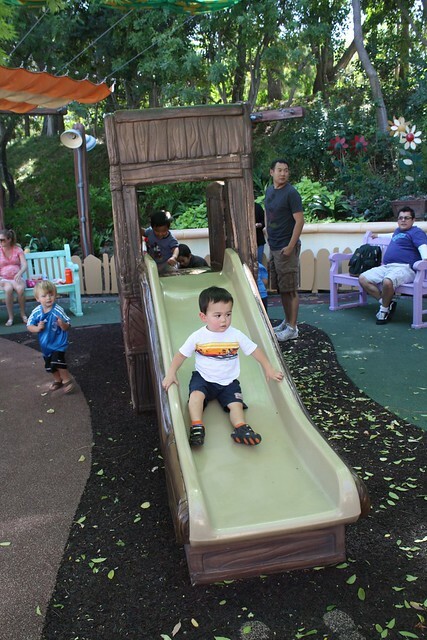 We visited Goofy’s house and he had a toddler playground area perfect for Vinny to run around in while we took a break. 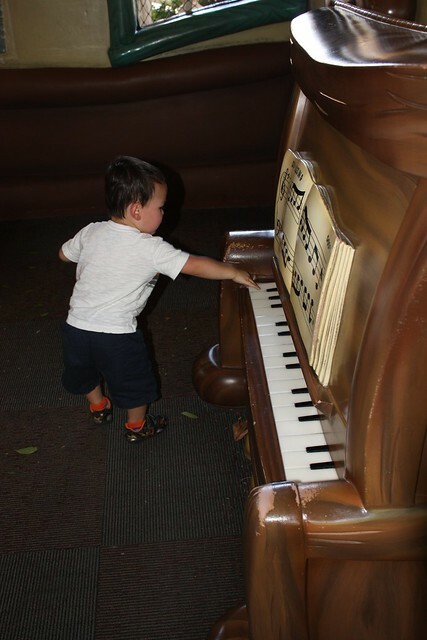 Inside the house was a cute little piano that made silly sounds when you banged on it. Vinny kept trying to turn the page of the book. 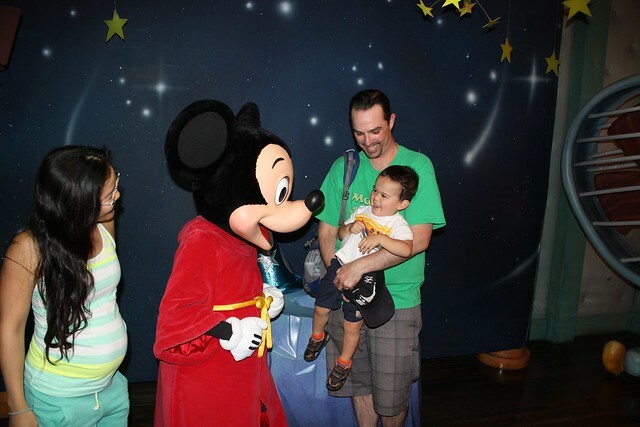 I wasn’t expecting Vinny to really care much but he had the biggest smile on when Mickey turned to meet him! It was adorable. Back to the hotel for Naptime! 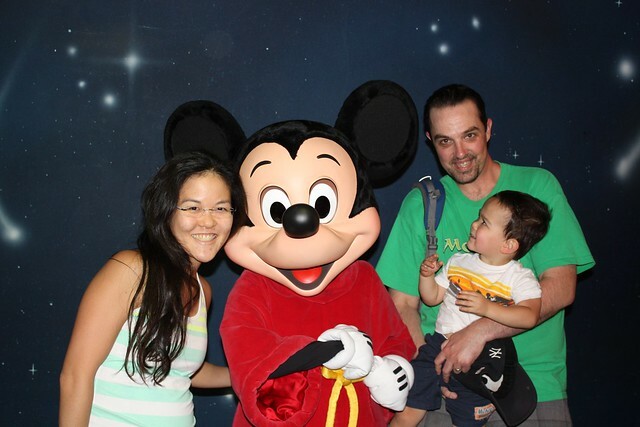 By the time we meet Mickey it was naptime! 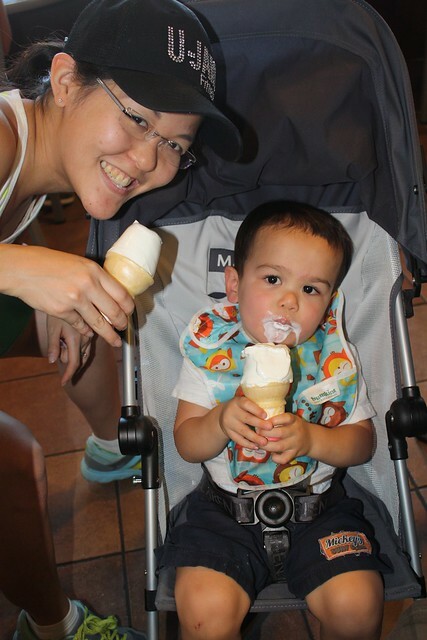 So we walked back to our hotel, but not before stopping for some McDonalds ice cream cones! I think this is Vinny’s first time actually eating a cone. First lick is always a surprise to him, he doesn’t expect it to be so cold! He ate all the top of it, and then we through out the rest. Naptime was a little rough — this first day he cried when we put him in the crib, but as per normal we just ignored him and eventually (hour later) he fell asleep, and slept a good 2 hours. Jeff and i relaxed, dozed off as well. 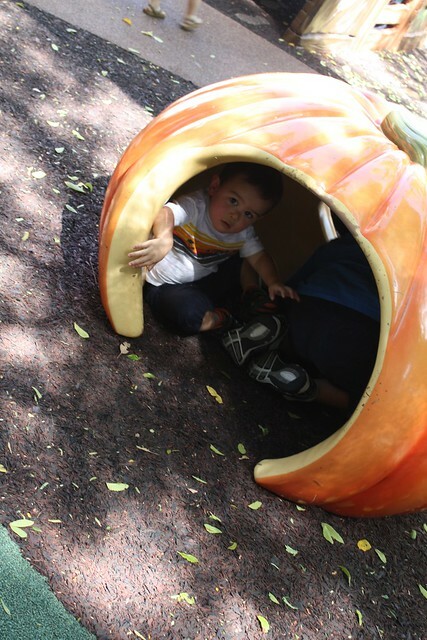 After nap time (and another snack for Vinny), we got ourselves ready to go back to the park and check it out at night. 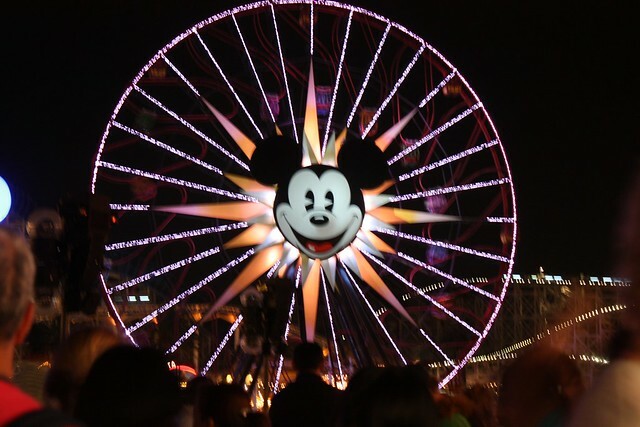 We planned to try and stay for the light show at 9:25pm in the California Adventure area. We ate dinner at a pasta/italian self-serve place. Again, it was fancier than what you might expect for theme park food, but it makes sense they have some better quality food considering the amount of traffic and the amount of money you’re paying to get into this place. 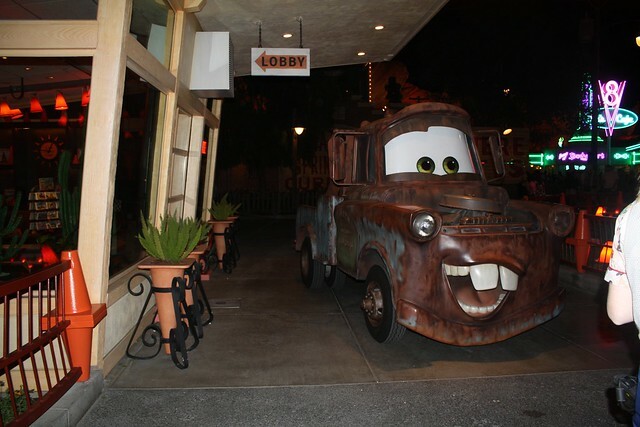 We visited the new Carsland area and took a few photos. 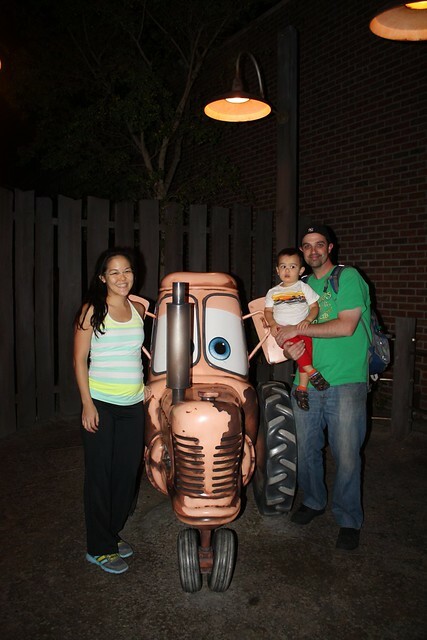 The Radiator Springs area was super fun to see – straight from the movies. 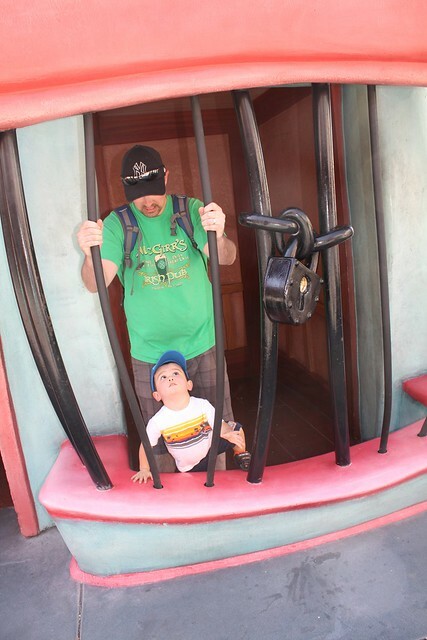 I dont think we rode any rides but we walked around the Bugs Life area (kid rides) and Hollywood Studio Backlot. We happened upon Mad Tea Party — they were having rave music! 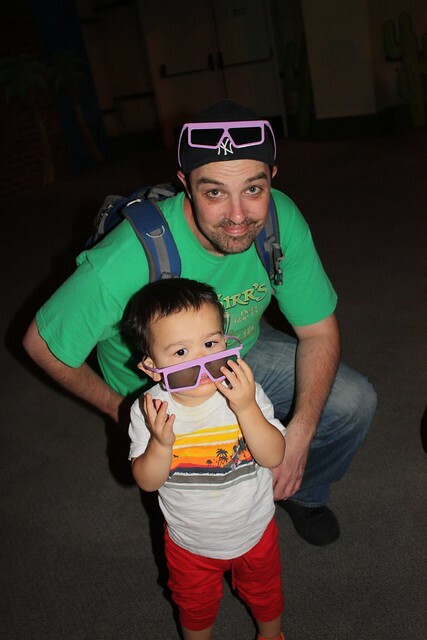 We decided to check out the Muppets in 3d — Jeff and i saw it last time we were here. We were interested to see how Vinny would like it. He ended up liking it a lot i think. He even wore his glasses the whole time! Since he face is so small and the glasses are one size fits all, he had to hold them up with his hands the entire time. It was so cute, too bad i couldnt take a photo (too dark). He jumped at certain parts in the movie because of the 3d. 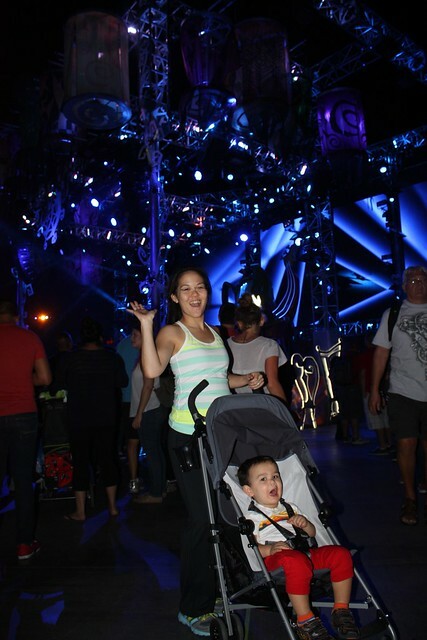 By that time, we were ready for the World of Color show. 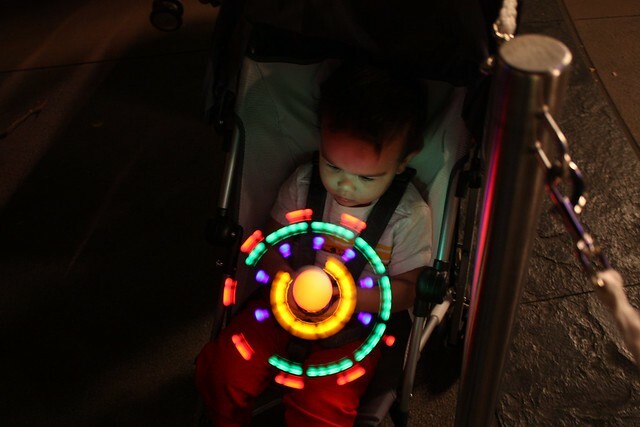 We bought Vinny this cool light-up toy that spins. He so totally loved that thing that he actually broke it — but we were able to exchange it for another one. We got in a good spot to see the show, and its about to start… and… announcer comes on saying due to gusty winds its cancelled. Wah wah! So we walked home and ended the night! Even with that, we had a great first day — Vinny behaved well, had a great time, and we were tuckered out for the night but ready to come back for more tomorrow. Congrats in baby #2 as well! !